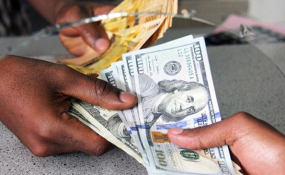 A forex trader exchanges Uganda Shillings with US dollars at a forex company in Kampala. Dar es Salaam — Commercial banks are aggressively marketing their foreign exchange services as they seek to cash in on the closure of bureaux de change in major cities. The Bank of Tanzania (BoT) last month closed at least 50 bureaux de change in Dar es Salaam for "flouting the law and regulations and procedures governing the business." A similar inspection last November saw all bureaux de change in Arusha - the country's tourism hub - being shut down. President John Magufuli said last December that tax evasion was also common in the operations of bureaux de change. "In that intervention, we found that one licensed bureau might have at least seven unregistered bureaux. Among 37 bureaux de change investigated, only one was registered," he had said. Since the closure of bureaux de change in Dar es Salaam, commercial banks have taken a leading role in the money changing business. Apart from sending text messages directly to their clients, some commercial banks are also extensively advertising their money services on electronic media. A number of banks - including NMB Bank Plc, CRDB Bank Plc and TPB Bank Plc - have introduced mobile facilities where people can change currency in addition to withdrawing money. Some of these vehicles are stationed at the Julius Nyerere International Airport (JNIA) in Dar es Salaam. NMB Bank head of communications and corporate affairs Joseline Kamuhanda said the bank has always provided forex services, but has extended them in recent months in a bid to bridge the gap created by the closure of bureaux. "We have strived to ensure that all our branches are able to provide this important service. We also have mobile facilities that can conveniently serve customers at airports," she said. TPB Bank Plc chief executive Sabasaba Moshingi said since commercial banks have now been tasked with providing currency changing services, the bank has been at the forefront of offering the services. CRDB Bank director of alternative banking channels Philip Alfred said the bank was now moving to ensure that people can readily change currency at its branches countrywide. "The aim is to ensure that these services are readily available throughout the country," he said, adding that the bank was also serving customers at JNIA and Kilimanjaro International Airport (KIA) through special vehicles. Travellers can now conveniently and safely change currency and withdraw money from ATMs at airports, Mr Alfred said.